That’s according to a new Associated Press report about the U.S. military’s efforts to purchase thousands of “backpack-sized” robots that troops can deploy to take bullets in dangerous situations — and its fear that it could be outpaced by similar efforts by China and Russia. These battlefield robots aren’t killer bots capable of using lethal force autonomously, a class of machine that is currently being debated worldwide. 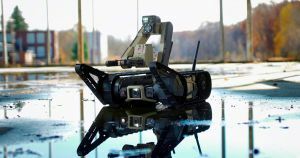 Rather, U.S. military leaders are interested in intermediary devices like Endeavor Robotics’ treadmill-sporting Centaur bot, which can perform reconnaissance and disable explosives — bots that soldiers can put in harm’s way instead of themselves. The investments are driven in part by a fear that international adversaries could come to dominate battlefield robotics. During a May senate hearing, according to the AP, Army Chief of Staff Mark Milley warned that China and Russia “are investing heavily and very quickly” in air, sea, and ground bots.